A mummy in Ancient Egypt is a body that has been preserved and carefully designed to last for an eternity. The process was long and tedious; however, essential for an Egyptian as it meant an existence in the Afterlife. The priests who performed this sacred ritual went to great lengths to ensure their mummies were carefully anointed, wrapped, and packaged. After the painstaking process was completed, these ancient packages were laid to rest inside a tomb or mass burial site. A mummy gives us a tiny glimpse into the life of an Ancient Egyptian—some royal and some everyday citizens. Each mummy is unique and no two are identical. The enchantments, prayers, wrapping style, and art all have a story to tell. The Mummification Process – How was a mummy prepared? Find out how it was done. Burial of the Mummy – Read about the burial process of a mummy as it was prepared for its final resting place. 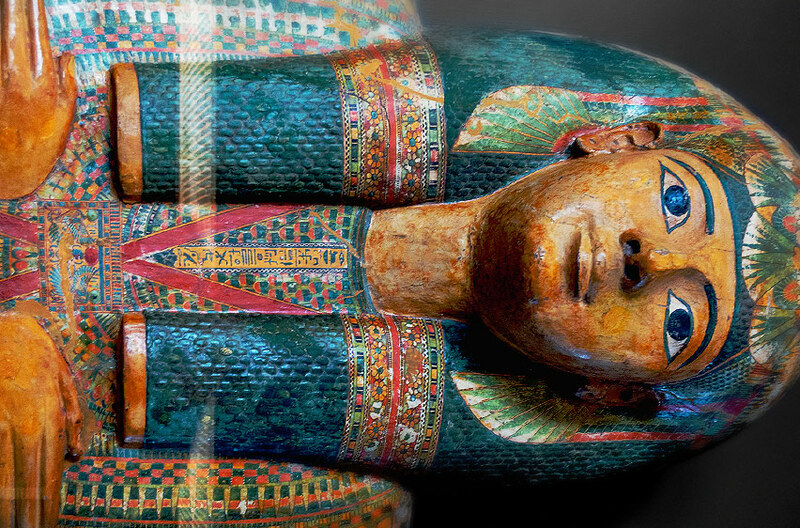 Examination of Mummies – Mummies don’t have to be unwrapped to be examined! Read about the different techniques used in examining these ancient packages. Animal Mummies – An animal mummy contains important information that also informs us about how the Ancient Egyptians lived their lives too. The Curse of the Mummy – Did King Tut’s curse really exist? Find out what really happened and you decide. Virtual Mummy – Come explore our virtual mummy and examine many of the objects wrapped with it.